TRON CEO, Justin Sun, finds himself under fire for mocking Ethereum’s performance in the last several days, when TRON itself performed successfully in comparison with the other altcoins. Sun and Ethereum’s co-founder, Vitalik Buterin, have been known for making remarks on each other and their coins’ performance, although many believe that Sun does it more than it might be necessary. TRON’s recent surge, and the fact that the project already has close to 100 dApps, have caused a 20% price surge over the past week, while TRON’s market cap is $1.7B at the time of writing. In the last several days, despite the recent crypto drop, TRON (TRX) started experiencing nice gains, which took many by surprise because most other coins are currently trading in the red. As one of the largest gainers, TRX has seen a 20% increase, with its gains nearly doubling in the previous week. The coin’s price climbed up earlier this week to around $0.03. However, TRON’s CEO, Justin Sun, who is known for his constant tweets and reports about TRON’s progress, decided to comment on his coin’s behavior on this occasion as well. While the crypto community has gotten used to Sun’s tweets, even when they are seemingly just for hype-building, many took issue with his newest comments on the TRON situation. Sun is known for making similar remarks about Ethereum in the past, and as TRON dApp creation started taking off, his comments about Ethereum, the project that allowed TRON’s creation in the first place, got increasingly more disrespectful. Competition is nothing new in the crypto space, just like in any other industry. However, many of the TRX community took issue with this kind of Tweeting behavior, even stating that there is not much worth celebrating, following the fact that TRX is down 88% from its all-time high. Sun’s Twitter battle with Buterin has also been going on for a while now. One recent example of this was TRON hitting a new record regarding the number of daily transactions, which was previously held by Ethereum. While TRON’s achievements are undeniable, the community has had multiple long discussions regarding the way Sun is expressing his excitement. Meanwhile, China’s crypto community remains skeptical about TRX, even going as far as to call it a pyramid scam, and accusing the coin’s developer team of manipulating the market. So far, there does not seem to be any clear evidence of this, on the contrary. In response, TRON has made moves to ensure that all of what it does complies with regulations. They did this by hiring a former US SEC supervisory attorney, David Labhart, who currently acts as TRON’s chief compliance officer. TRON has had other achievements which have likely positively impacted its price, meaning that China’s crypto community might be wrong in their assessment. As for TRON, the coin is experiencing losses once again, at the time of writing. Tron’s price is hovering around $0.26 per coin, with a market cap of 1.7 Billion USD. 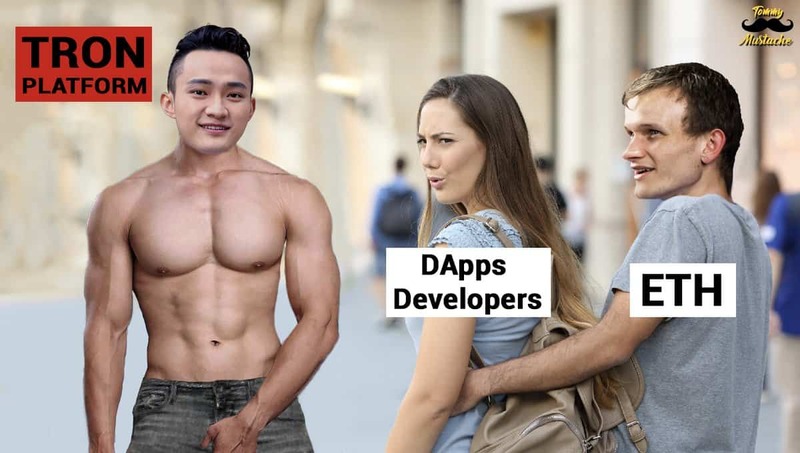 The post TRON CEO, Justin Sun, Mocks Recent Ethereum’s Poor Performance: the Crypto Community is not Impressed appeared first on CryptoPotato.